French May are not the most popular of suppliers when it comes to kitchen appliances, in fact it is very hard to find anything by the company other than the product we are looking at today. But with this Air Fryer they are looking to burst on the advanced tech kitchen equipment scene with the best mini deep fryer they can produce. This particular Air Fryer may be hard to distinguish from other models, but French May are looking to keep the same great design of its competitors, and inch those developers out by adding their own sense of finesse and class to the device. And it seems to be working as most of the digital air fryer reviews that can be seen involving the French May model are overwhelmingly positive. 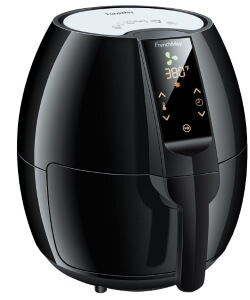 This Air Fryer boasts an LED touch screen for easy use, 3.7 quarts of space for those are looking to cook a large amount of food at once, and a smooth and modern design with jet-black, high-quality plastic. With a price tag of just under $100 they are looking to take both the budget and more expensive markets in their stride with this model. In conclusion, French May have produced a product here that is definitely a very good Air Fryer. It cooks things extremely evenly and makes no mess in the kitchen whatsoever when doing it. It is also multi-faceted, so can cook and bake a number of things other than simply frying foods as well. For the price tag that it has, it definitely serves as a great Air Fryer. The only issues though is the problematic nature of the digital display, and the power of the Air Fryer itself. Make sure that if you buy this model, you means test it thoroughly before using. That way you’ll be able to claim a refund if it is faulty. Not the best Air Fryer on the market, but by no means the worst!